Olive is good source of edible oil and is also used for table purpose particularly for pickles. The olive has not only nutritional and medicinal value but its fat content is also free from cholesterol. It is also used in food preservation, textile industry and cosmetic preparation along with variety of other purposes. Olive oil is one of the few widely used culinary oils that contain about 75% of its fat in the form of oleic acid (a monounsaturated, omega-9 fatty acid). Olive fruit due to its nutritional and medicinal importance is a blessing of Almighty/Allah. Olive has been referred in noble way at many places in the Holy Quran and its importance has been certified by many saying of Holy Prophet. If you are planing for growing olives, you must read the following Frequently Asked Questions About Olive Farming (FAQs). Where are olives found in Pakistan? Olive was introduced first time in Pakistan by PARC during 1986 under an Italian Project titled “Fruit, Vegetable and olive Project” funded by Government of Italy. 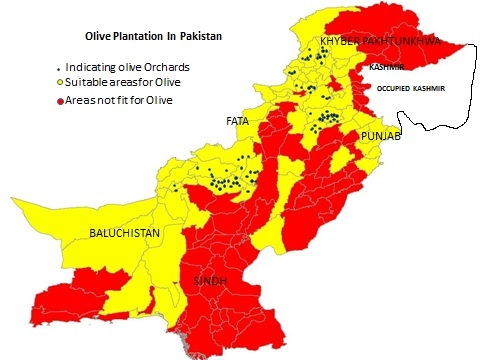 After this project a general survey was conducted to estimate the number of naturally occurred wild olive specie “Olea Cuspidata” and found more than 80 Million wild Olive plants in different district of Pakistan. Under another olive project of federal government 5.5 million olive plants were top worked but less than 1% plants survived in the result of top working because of management of top worked plants. Where do olives grow or what kind of climate do you need to grow olives? Olives grow in the region with sub-tropical and temperate climatic conditions. Hot weather conditions without much shade are suitable for olives. The trees need full sun and light winter chill for the production of fruit. Extremely low temperatures (-10˚C) can damage the mature trees. The average rainfall of the region should be around 650-900 mm. What are the factors for selecting the variety of olive for farming? Can I grow olive tree in Pakistan and what countries are considered as the largest producers of olives? Yes, the olive tree can be grown in Pakistan only if suitable conditions are available. Olive tree is native to the Mediterranean area and the leading producers of olives are Spain (52 lakh metric tonnes), Italy (32 lakh metric tonnes), Greece (22 lakh metric tonnes) and Turkey (12 lakh metric tonnes). The other countries producing olives are Tunisia, Morocco, Syria, Egypt, Portugal and Algeria. How many olive trees can you get per acre? The traditional spacing between olive trees is approximately 7 m or 30 ft. This spacing is no longer used except in regions that are deserted dry farm regions. The high density planting can accommodate 200 to 350 trees per acre i.e. approximately 494 to 865 plants per hectare. The high density system of planting can be used with any variety of olive. There is one super high density planting system practiced for olive cultivation, where the spacing between plants is 5 x 13 ft. This system can accommodate approximately 2083 trees per hectare. What is super high density planting in olives and can all varieties be cultivated using this method? The super high density farming can be used with three varieties of olive trees such as Arbequina, Arbosana and Koroneiki. No other variety of olive is cultivated using this method of spacing because they get too closely spaced after few years. In the super high density system of spacing, the plants are spaced 5 x 13 ft in high vigour sites and 4 x 12 ft in low vigour sites. The Plants in the super high density farming sites are not allowed to grow beyond 9 to 10 ft height and 6 to 7 ft wide. One important thing with super high density farm is that it is difficult to manage the farm in regions with deep soils and high rainfall. How much olive oil does a tree produce? How many kilos does an olive tree produce? The yield from an olive tree greatly depends on the size, age, variety and the growing conditions in the region of the farm. Very tall varieties (40-60 ft high) of olive trees are capable of producing 800 kgs of olives annually. When the trees are pruned to smaller height, they produce an average of 50 kg olives. Watering and fertilizing the plants also improves the yield of the farm. How much is a ton of olive’s worth? The price of olives depends on the variety being cultivated. Good quality fresh olives cost around Rs 300 per metric ton. Most of the packed olives available in Pakistan are imported varieties and the exact price of farm grown fresh olives is not known. The above mentioned price could be a possible rate for olives in Pakistan. Can you grow olives indoors? • Provide them at least 6 hours of direct sunlight. • Use large containers with proper drainage holes. • Water the plants as and when needed. • No additional humid conditions are required for olives at home garden. • Fertilize the olive tree or plant once in a month to keep it healthy. • Watch the plant regularly because indoor olive plants are susceptible to scale diseases. • To stimulate flowering in the plant or tree, it needs a drop in temperature to 50˚F. • Prune the plants regularly to keep them short. • Replant the olive plant after one year such the roots have enough space to grow. Can olive trees grow in pots? What is the best fertilizer for olive trees? When the olive tree is in the growing period, 2 pounds (0.907 kg) of urea or 50 pounds (22.6 kg) of compost is supplied. Young olive trees should be provided with 0.02 kg of urea every month. When are the fertilizers applied to the olive trees and how? Fertilizers should be applied at the base of the plant at a certain distance from the trunk. The farm should be immediately watered after fertilizer application. Foliar spraying of fertilizers is only done during emergencies or deficiencies. No fertilizer should be applied to the trees during winter (after August till March) because the trees do not grow during this period. Most of the fertilizer is applied during the growing season. How long does it take for an olive tree to bear fruit? How long do olive trees live and how big do olives trees get? The average life span of an olive tree is expected to be around 500 years. The olive tree can survive under neglected circumstances for many years. A mature olive tree attains a height of 40 ft with a 20 ft wide spread. How long does it take for the olive seed to sprout? Under the right atmospheric conditions olive seed takes 40 days approximately to germinate. During the germination period, the seed needs moist soil condition and weed free area. How do you sprout an olive seed? • Use a 3 inch container and fill it with well draining soil (one part coarse sand and one part compost). • Plant the seed to a depth of 1-2 inch and water them as required. • The pots are bagged into polythene bags to maintain moisture and get some greenhouse effect. • These bags are placed in a warm and light area for germination to occur. • Water the area to keep the top two inches of the soil moist. • Seed germination takes place in one month time. • Remove the pots from the polythene bags once the sprouting begins and transplant them into a main garden area and continue to water regularly. Can I grow olive tree from a cutting and how? • Obtain the cuttings from the mother plant in the month of August or September. • The cutting should be of pencil thickness and should be obtained from below the point where the leaf emerges (8 inches at the end of the branch). • Potting soil mixture (one part sand, one part, peat moss and one part vermiculite) is filled into a container (4 inch wide). • Lightly dampen the soil before planting. • Remove all the leaves at the lower end of the cutting and dip it in rooting hormone. Then plant this cutting into the potting soil exactly halfway. • Cover the container and cutting with a plastic freezer bag and place it in the sun. • Water the cutting when the soil gets dry. • Fertilize the seedling suitably and transplant it if required. How do you prune olive trees? While pruning the olive trees, it is preferred to make a few well-placed cuts rather than making many small cuts. A lopper or pruning saw is used for this process. Open centre or vase pruning is a very common practice while olive farming so as to facilitate sunlight penetration into the central parts of the tree. Branches that are taller are also removed to keep the height of the tree small (generally done for olive trees grown in containers). Pruning is done once in three years during the period from the end of winter and flowering period. These trees can also be pruned in spring or early summer after the appearance of flower buds. Trimming of the tree has to be always done only after the winter rains are over. How do you cool and store olives? What are the types of designs for permanently set trees in an olive orchard? • Square pattern (equally spaced rows; not generally used when filler trees are planned). • Offset square pattern (square design with adjacent rows being offset). • Hexagonal or equilateral triangle pattern (similar to offset square pattern, but with equal distance between trees; accommodates 17.5% more trees per acre than normal). How are the filler trees within the olive orchard designed? • Hedgerow (spacing of trees is 8 x 16 ft, 9 x 18 ft or 10 x 20 ft; not easy for management; doesn’t provide sunlight to the inner branches due to overcrowding). What type of soil is suitable for the olive trees? Olives thrive in regions with marginal soils. The soil should be well-aerated and well drained in nature. Shallow soil base should be avoided. Too much sandy soil is not suitable for olive cultivation. Soil with 30% clay and high gravel content is considered best for olive farming. The pH of the soil should be in between 5 to 6. How much water is required by the olive trees? A young olive tree is expected to require 15 to 20 litres of water per week during the growing season. Providing irrigation is an important factor for high quality fruit development. The volume of water required by the trees is dependent on the factors like age of the tree, size, humidity, wind, soil texture, soil depth, growth stage, rainfall etc. Drip irrigation system is deployed to irrigate the olive farms. Some other watering recommendation for olive trees are: newly planted trees (0-1 year tree needs 10 litres of water per week in summer), five year old olive tree needs 675 litres of water per tree, if the soil is bone dry and a ten year old olive tree needs about 1875 litres of water per tree per watering cycle. How are the olives harvested and when? The best time for harvesting olives is from late August till November, but again, it depends on the variety of the olive tree and the desired ripeness of the fruit. Olives are initially green in colour, but gradually turn rosy and then black upon ripening. Most of the olive farm practice hand picking method for harvesting olives. Tarps are placed under the olive trees before dislodging the fruits from the tree. A rake is used if the fruits are being harvested for oil else they are hand-picked. What water quality should be avoided for irrigating olive trees? Olive trees should not be irrigated with water that contains more than 2 ppm of boron, more than 3.5 ppm of bicarbonate, more than 3 deciSiemens/m of EC, more than 3 milli equivalents of sodium per litre and more than 345 ppm of chloride. How are pests and diseases managed on olive farms? The olive trees are badly affected by anthracnose and peacock spot. The trees are mostly infested by pests like black scale, olive beetles, olive flies, seed wasps, leaf rollers, termites, parlatoria scale, apple weevil, garden weevil, rutherglen bug and olive lace bug. Most of the diseases and pest occur due to improper farm management techniques like poor irrigation, irregular pruning, use of unsterilized equipment, etc. Using recommended fungicides and other management practices can improve the condition and control the spread of diseases. How is oil extracted from the olives? • Cleaning the olives after harvest. • Grinding them into a paste using required equipment/machinery. • Malaxing the paste for almost 20-45 minutes. • Separating the oil from the water and solids using two phase centrifuges. • Additional processing steps like refining (steam processing), bleaching the oil, deodorization etc.